Self-determination theory distinguishes three universal basic psychological needs, the need for autonomy, for competence, and for relatedness. The fulfillment of these needs is necessary for us to feel well and function well. 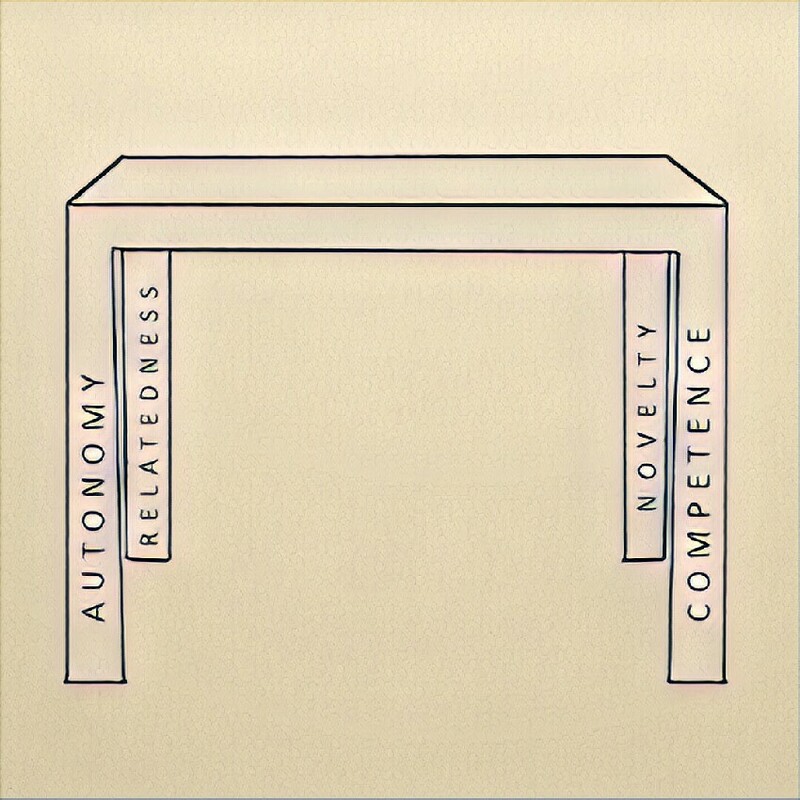 The need for autonomy refers to the experience of being able to make your own choices and to stand behind what you are doing. The need for competence refers to the experience of being effective and capable of achieving desired outcomes. The need for relatedness refers to the experience of a mutual connection with and care for important people your life. Recent research by González-Cutre et al. (2016) indicates there may be a fourth basic need: the need for novelty, the need to keep on experiencing new things which deviate from your daily routine. 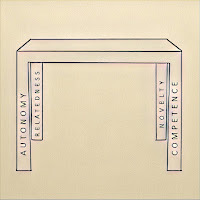 These four basic psychological needs can be viewed as the legs of a table. Together they enable the top surface to rest on something. A table with one of more legs which are a bit shorter will start to wobble. You can't work calmly at such tables. When all legs are equally long -in other words: when all basic needs are fulfilled- there will be a stable table at which you work well and on which you can put things without them falling off immediately. If certain psychological needs are thwarted, as is shown from research by Van Steenkiste & Ryan (2013), (1) we will not feel well, (2) we will pursue need substitutes, and/or (3) we will engage in compensatory behaviors. Examples of substitutes are extrinsic goals such as pursuing fame, power, and money (read here why such goals are less beneficial than intrinsic goals). Examples of compensatory behaviors are loss of self-control, rigid behaviors, and oppositional defiance. To stay within the metaphor of the table: that the table wobbles irritates us. We may try to solve this by putting a beermat under the legs which are too short. But this may not work well because the beermats keep shifting and we stay distracted. We are partly dependent on others in the fulfillment of our basic needs. The way we are raised by our parents has a strong influence on the degree to which our basic needs are fulfilled. Also, how we are treated at school or at work is important for our need fulfillment. Fortunately, we are not completely dependent on others. In the metaphor: we don't always have to settle for the table we are given. We might choose to sit at another table or we can repair the legs of our own table. If one of the basic needs is thwarted, we can do things that might lead to improvement. Do you feel you can endorse what you are doing? Do you feel competent fo achieve what you want to achieve? Do you feel connected to the people who are important to you? Do you experience surprise and novelty in your life? Or does your table wobble? Which leg would you like to extend? What would you find interesting to do or learn more about? What is important to you in your life and how can you act and choose accordingly? How can you protect yourself a bit better against things which collide with you interests and values? Which knowledge and skills would you like to develop more in order to become more effective at achieving goals which are important to you? How and when will you work at your own growth? Which people are important to you? How can you improve your relationships with those people? From whom would you like to get help? How could you bring a bit more surprise and variety in your life? How could you approach what you have to do in different way so that it may become a bit more interesting? Our life is full of problems, solutions, adventure, excitement, questions, and answers. Therefore, we should choose what is important in our life, otherwise, we are wasting our time in unnecessary things. I would like to follow some of the essential ingredients from this article, regarding how to fulfill our basic needs. Thanks for this wonderful article.